Price-conscious home buyers are lured into buying foreclosures by the low prices advertised for properties in foreclosure. They hope to show up at the auction and win the lowest bid. Even against the pros who bid. Further, many of these homes are not available for inspection prior to purchase, and cash is often the only acceptable payment. Is it smart to buy a home that you cannot inspect? It could be if the price is low enough to compensate you for the amount of work that might be required to bring the condition of the home to market standards. But first you have to beat the pros who tend to dominate these auctions. Before you rush forward to buy a foreclosure, stop to think about some of the drawbacks and repercussions if you can't get in the house to inspect the interior. Consider the cost to repair damage or upgrade the home against the base price. You might be better off buying a fixer home from a regular seller. Also, the bank does not care about the condition of the home and will not generally renegotiate nor discount for any discovered defects. If the property is occupied, the successful bidder is typically responsible for removing the occupants, who may not be the previous owners. They could be relatives or friends of the owners, renters or squatters. You might have to evict them. If you are unfamiliar with eviction processes, you should hire a lawyer to handle it for you. Be aware that tenants who are sued for eviction sometimes retaliate. A better solution might be to pay or bribe the occupants to leave. One such home in Yolo County, California, was rented to a dubious couple: a former convict recently released on parole and his partner with sketchy credit, who flinched at loud noises like a domestic abuse victim. The seller, unaware that his deed of trust contained an "assignment of rents"—meaning the lender had a right to collect the rent if the owner did not make his payments—stopped paying on his piggyback loans and didn't much care who he rented to as long as they paid him. Fully intending to pocket the rents and forget about his mortgage loans, the seller listed the rental for sale. His agent made an initial attempt to gain access to the home. The ex-con, a neo-Nazi-type with a shaved head, massive tattoos, and holding back a barking pit bull, peeked through the door and then slammed it in the agent's face. As soon as the For Sale sign was planted in the lawn, the tenants stopped paying rent. Neither the lender nor the seller could collect any money from the tenants. The agent could not show the property. This was an ugly situation. The lender (who held both the first and the second loan) filed for foreclosure and vowed to file a deficiency judgment against the seller, which junior lenders can do in California if the loans were not purchase money. Because these homes are purchased "as is" from the lender or HUD, there is no guarantee of condition. Sometimes it is possible to inspect these homes prior to making an offer but sometimes, as in the above example of the home in California, access is not granted. When sellers realize they are about to lose their homes through foreclosure, it's not uncommon for them to stop caring about the home. If something breaks or malfunctions, they aren't going to fix it. If they are angry or desperate enough, it's possible they might actually destroy the house. An effective way to flood the home is to turn on all the water faucets, plug the drains and leave. Others smash out walls, then pull out the copper pipes and wiring to sell as scrap metal. Owners will also rip out fixtures and sell the appliances, even the kitchen cabinets. Some horrible-excuse-for-human beings even leave animals behind, locked inside without food or water. Buying foreclosures is not for the easily shocked or inexperienced buyers. It's best handled by the pros and is not recommended for first-time home buyers. We don't care what seminar you attended—if it's not giving you this information, it's not preparing you for reality. We know of homes that sold as foreclosures in California that had been empty for more than a year. They were boarded up and mold had developed. When banks send in companies paid to secure the home, they often just turn off the water and leave the mess behind to rot, assuming that eventually it will dry up and some unsuspecting buyer will come along and purchase the home. The bank is not required to disclose what it does not know. Further, some people believe banks are stupid or that banks do not understand the realities of real estate. That's a misconception. Banks fully understand their actions. They hire asset managers from Yale and Harvard. It's the consumer who is often duped. 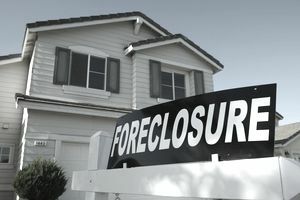 Do Banks Really Pay You to Move During Foreclosures?